Deanna’s suspicions were aroused last week when she realized herself that she was putting Rick’s people in many positions of power. When Gabriel paid her a visit, what he said merely sparked the flame. Now after her son’s death she’s in full protection mode. 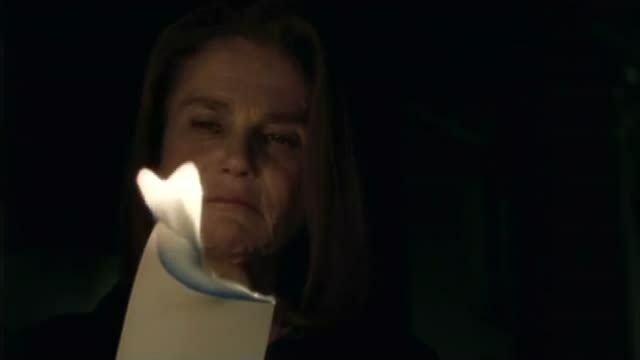 She’s burning sympathy notes and warning Rick against the method of punishment he wants for Pete. She still holds control over the town, but that control appears to be slipping a bit. Sasha’s progressive slide down the slope of insanity has been on feature for about 4 or 5 episodes now. Michonne and Rosita take off after her. When they find her she appears to have a laser focus and intensity. She’s clearing a path. Or so she thinks. Together they take down a small horde of walkers, but there’s no payoff moment of resolution. 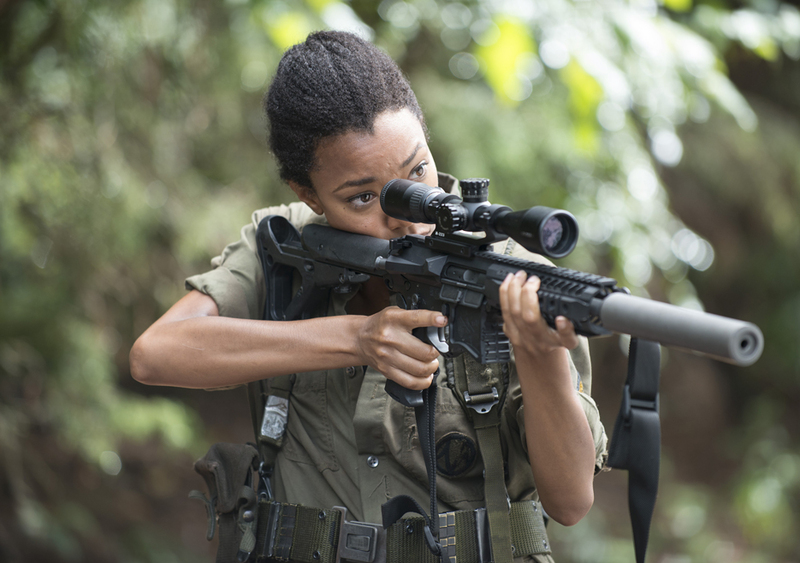 Sasha is still angry and Michonne basically has no answer for her. Michonne has flashes of where she has been before in her determination and drive, and she sees that in Sasha’s actions now. What’s troubling Michonne is that she’s feeling herself become soft to the real world in the short time she’s been behind the walls of Alexandria. She wonders if having that safety is worth losing the edge needed to survive outside the walls. For that reason she can’t confidently tell Sasha that she’s putting herself in danger. TV’s odd couple (Daryl and Aaron) come across a campfire they see from a distance at night. When they arrive at the site in the morning they find two people, very recently murdered, one left tied to a tree with a ‘W’ on her forehead. This is basically all the info we’re giving on this new group, or person, leaving these W’s. It makes the viewer wonder if every walker marked with a ‘W’ actually marks a kill by this mysterious group rather than just marking pre-existing walkers they come across. Hmmmm…. Alright, let’s dive into Rick vs. Pete. Rick has eyes for Jessie, so when Carol tells him at the end of “Spend” last week that Pete is hitting Jessie, that’s all he needs. He’s ready to pounce and “do what’s necessary” to protect this community and his people. That sounds awful familiar to something Shane always said Rick wasn’t prepared to do. You’ll recall that Shane didn’t believe Rick could make the hard decisions (season 2), and therefore he wasn’t worthy of keeping Lori and Carl for himself. Now look where Rick is. He wants to take another man’s wife (something Shane did), and he’s prepared to kill a man rather than risk letting him loose and it come back to bite them (something Shane wanted to do). 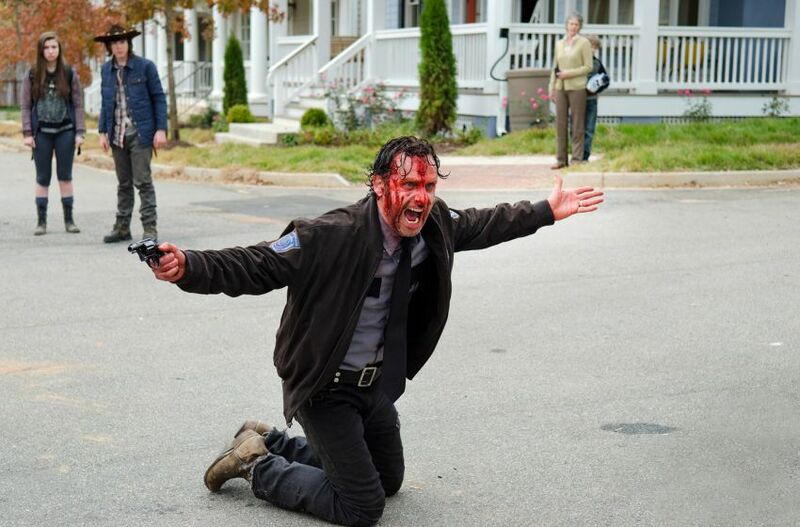 The internal struggle is visible for Rick. Andrew Lincoln does such a great job of giving that inner turmoil a face. 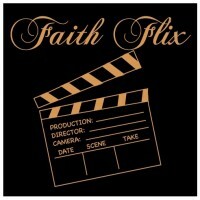 Making it visible on the surface. He’s either fighting the urge to take this all the way, or he’s mustering the “guts” to make himself do what he thinks (and Carol told him) is necessary. Kill Pete. They finally have it out and the fight carries into the streets in front of everyone. Pete pushes Jessie off, Rick pushes Carl off, and Rick finally puts Pete into submission with a choke hold when Deanna comes along and demands he stop. Here we get a blood-soaked Rick making a pretty spectacular speech about doing what’s necessary and living in the “real world”, a-la Shane. Before he can conclude Michonne gives him a swift punch to the back of the head, knocking him out and ending the episode. Not bad but not real great either. Still a lot of slow burning until the real escalation happened between Rick and Pete. I was really wanting more info on this group marking the walkers with a ‘W’. We only learned they’re violent towards people which isn’t a big surprise. If they come into play in the season finale it will almost definitely be something frantic or unexpected near the end of the show. The showdown/fight between Rick and Pete is very worth the time spent building up to it. There was zero follow-up on what Gabriel told Deanna, even though Maggie heard the whole thing. We’re supposed to believe that she hasn’t told anyone yet? Previously: I predicted that Jessie’s husband will reveal something major about Alexandria to Rick or someone else in the group. That opportunity has likely passed (-1). I predicted that Enid is the one that actually took Rick’s blender gun with the ‘J’ on the handle. Wrong, it was Nicholas (-1). I also predicted Rick’s new position as constable will put him in a position to administer a rule or law against one of his own. It’s pretty safe to say he’s lost that position now (-1). Pretty awful week for my predictions, hahaha. New predictions: Readers of the graphic novel probably have an inside guess on who’s marking the W’s. I am not a reader of those novels, but I’m aware of a group called the whisperers. That name is basically all I know of them, but knowing that name was enough to draw my curiosity when Enid repeatedly whispered things to Carl this episode. Is she a mole for this outside group??? We’re starting to see the Walking Dead crew shown in a more negative light and it’s working. Even if there are the occasional hiccups in the story department. Nice review Gene. At least Rick is certainly being shown in a bad light. Everyone else you can either understand their breakdown or you can see the angle they’re playing. Thanks for reading up, Dan.